What I Say....I've read Suzanne Palmieri before and really enjoyed her. But I struggled with this book. Not the story, I liked the story, but there is honestly something wrong with me when it comes to New Orleans. I absolutely HATE anything to do with it. I hate gumbo, I hate swamps, I hate crawfish. But the thing I hate the most is Cajun dialect. Reading it or hearing it, doesn't matter, it's like nails on a chalkboard for me. I must have had a bad past life experience in New Orleans, because I've never set foot in that state (and never would willingly). So although I liked Frances as a character, and the ghost story, it was hard for me to get into the book because I couldn't stand reading it. The author was very heavy on authentic dialect, which is probably the right thing, but I just couldn't get into it. 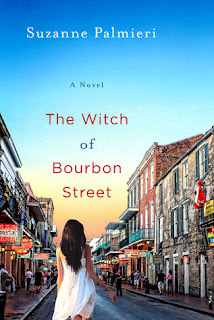 This had nothing to do with the story or Palmieri's writing - I've loved some of Pamlieri's other Witch books, but I should have known once I saw the words, "Bourbon Street" to take a pass. The current Goodreads rating is 3.98, which is awesome. Looks like other people don't have the unreasonable prejudice against the bayou like I do.